I recently took a look at a new book from O’Reilly Media that’s a thoughtful introduction to the general concepts of data analysis. Unlike most books on data analysis, this is not software-specific and it does not focus on some complicated aspect of statistical or financial analysis. 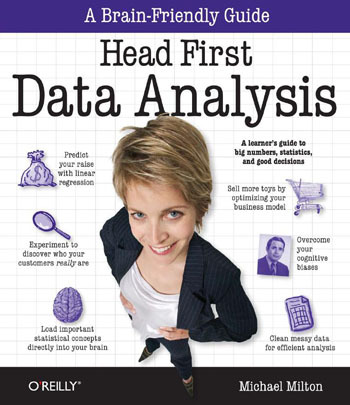 The book is Head First Data Analysis by Michael Milton. In its Head First series, O’Reilly is trying to provide books that introduce computer-related topics in a way that speaks to the way our brains learn. These books teach the material using real-world scenarios with lots of activities to engage us in thinking, rather than merely throwing a bunch of information at us and hoping that some will stick. Head First Data Analysis fills a useful gap at just the right time. Now that organizations are beginning to take the need for effective data analysis more seriously and people of all types are becoming responsible for the task, this book presents the basic concepts in a way that is practical and accessible to all. Milton doesn’t go deeply into any of the concepts, but that’s by design. If you’re comfortable with statistics, this is not the book for you, but if you’re one of the many people who must make sense of quantitative information as part of your job and you’ve never been trained in data analysis, this book will set your feet on the path. Milton does a good job of identifying the basics that people need to get started and explaining them in simple ways that make them immediately useful. It’s a workbook of sorts, with exercises throughout. If you really want to learn, this is the way to do it. Head First Statistics is also worthwhile, especially with the really great opening chapter on visualization. Bought my own copy – a fabulous book. Started gaining traction with me about 10% through and then found myself being immersed in new, interesting stuff. While i’m fortunate to have Tableau Desktop Professional at work, R certainly looked impressive too – especially the ability to read and write CSV files after doing gymnastics using Regular Expressions. Now lent it to our Tableau Jedi at work – and am sure i’ll buy extra copies for a few more of my folks too. Thoroughly recommended! A very impressive learning way ! Even you have many data analysis skills, it brings you a great overview in order to enhance productivity, effectiveness and communication. Exercises are funny and you can read this book step by step. I’m French, but this book is easier to read despite the language than many borring technical french books.